If Air Canada and the weather cooperate, tomorrow I’ll be flying from Vancouver to my hometown in Ontario, visiting with my parents for a short and sweet pre-Christmas stay. I’m rushing around today trying my hand at candy making (!!!) and baking some favorites so that I don’t arrive empty-handed on my parent’s doorstep. Before I leave my poor husband alone with his probable weekend diet of hotdogs and fried eggs, I’m sure that something nice and homey for dinner would be very much appreciated. Last night while I perused my usual web haunts, I stumbled upon Joe‘s recipe for Mustard & Maple Pork Tenderloin. I made a couple modifications, but it was such an easy recipe to put together and the pork came out so tender, juicy and flavourful, that this dish will definitely be made again and again. The best part of this dish? The leftovers! Today’s lunch was some leftover pork sliced extra thin and served between 2 slices of thick sourdough bread topped with homemade pickles. Yum! 2. Take 1 T of dijon and spread it over the tenderloin, making sure it’s all covered with the mustard. In a large cast iron skillet, heat oil over medium-high heat. Add pork and brown all sides evenly. When evenly browned, move pan into the oven and cook for about 20 minutes. Remove tenderloin from the oven, transfer to a plate, and let it rest before slicing. 3. While pork is resting, add the vinegar, maple syrup and remaining mustard to the skillet. Cook over medium heat while scraping all the brown bits from the bottom into the sauce. Add any juice from the pork into the sauce. Bring to a boil and reduce until thickened. 4. Slice tenderloin and pour over sauce. Kickpleat, are you planning any visits to Toronto? If you are, let me know, I’d love to meet up with you. 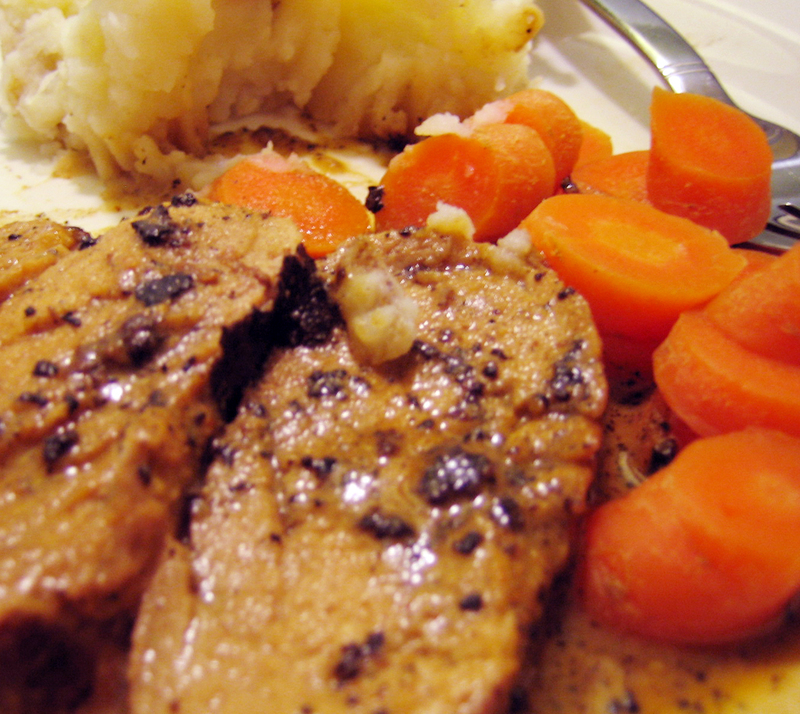 Your saucy pork looks divine and I can have it with mashed potatoes too! Will you be posting your candy-making results? I’m keen on finding a recipe for white chocolate peppermint bark. I stocked up on candy canes just for that purpose. Enjoy your trip home! Southern Ontario has been having great weather lately. Hopefully you’ll sample some of it in time. Your stylish greetings cards from Etsy arrived today! Awesome. They look so good. I can’t wait to mail them out to friends 🙂 Thanks!! good luck! and i’m so glad you got the cards, too! as per that peppermint bark recipe… what if you don’t have a double boiler? hi jenn, i’ll be in london, so i won’t be around elmira except whizzing by on the 401! crystal, you could always melt the chocolate in the microwave on lowish heat. i’ve never tried it in a microwave, but it should work as i’ve read that a lot of people prefer melting chocolate in a microwave! I don’t have a double boiler either so what i usually do is use a heat proof bowl that fits comfortably(nests) above the pot with the boiling water. I put the chocolate squares in the heatproof pyrex bowl and the heat from the boiling water underneath will melt the chocolate. Works for be every time. I think the method is called ‘bain marie’. p.s. use low-medium temp. to prevent the chocolate from burning. We’re always looking for new ways to make pork tenderloin at my house, so I’m very excited about tyring this one – it looks amazing. I’m really enjoying reading through your blog – Happy Holidays! kickpleat, my hubby made this last night for a holiday party we had and everyone raved about it! I don’t eat meat, but think the sauce would be great as a salad dressing!